Update: YouTube’s service has returned. What follows is the original post. 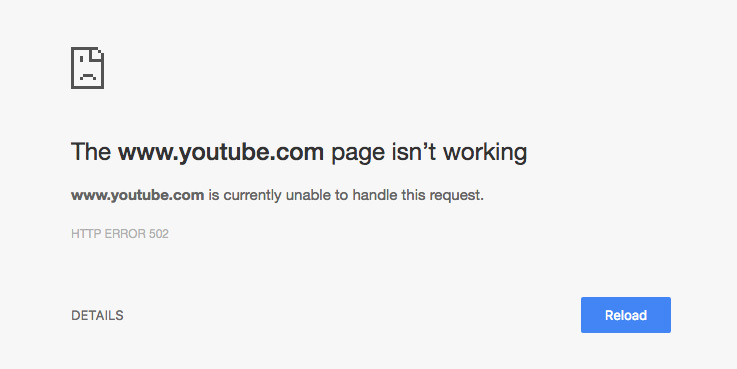 It appears that YouTube’s site is down for some users. Ok. It looks like youtube is down for most people. We should all huddle together. Everything will be ok I promise. It isn’t clear what the reason is, but the site has been unavailable for the past few minutes at the time of writing (5PM IST). However, it might only be certain servers, as we’ve confirmed that YouTube is still up and running in India. We’ve contacted Google to find out more and will update this post if there’s a response. Update: YouTube is now back online for some, but service is intermittent as of 5:49PM IST/2:20PM CET/8:20AM ET/5:20AM PT.